Enjoy our 100,000 square foot casino 24 hours a day.With more than 100,000 square feet of gaming space, including 125 table games and 2,900 slot machines, Harrah's New Orleans has something for everyone. 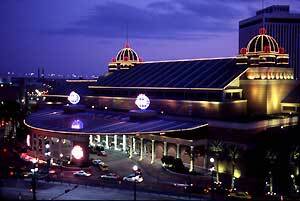 Harrah's New Orleans offers 10 varieties of table games, a total of more than 125 tables, 20 of which are Poker. Slot denominations rage from 5 cents to $500 for a total of 2,900 slot machines! Whatever your musical tastes, New Orleans fits the bill. Every day, legendary musicians take the stage at clubs all over town - and Harrah's New Orleans is no exception. Our Jazz Court transports you to a lush French Quarter courtyard with shady oaks, starry skies, cocktails and daily live music. Harrah's New Orleans offers non-stop gaming set among the sights, sounds and tastes of New Orleans. We're just steps from the French Quarter. . . and light years from the ordinary.